Hi Everyone!! Hope you are well! Please please forgive me for being a bit out of touch the past week- we've had some heavy family issues, and things have been really challenging. I feel that we are out of the "hard part" so I'm staying optimistic and full of love. Thank you for your understanding! I kept the look natural with a few exceptions. And yes- you see me sneaking in my beloved Paperself lashes again!! I couldn't resist. I adore them! I'd wear them every day if I could! Anyway- here is the breakdown! ♥ A mix of several of the blushes from the Nyx Crimson Amulet Collection. No kidding. I played with them all! ♥ Contouring of cheekbones, nose, and temples was done using the Coastal Scents Blush and Contour palette. ♥ EBAY. Thank you EBAY! The crown was purchased last year, so I don't recall the details- seller or cost :-( The ear cuffs and earrings were also found on Ebay. I got two pairs of the ear cuffs, gold and silver and they were maybe $6 for the two sets. Note: I am highly allergic to adhesives and some molding materials, so building a pointy ear for me was not an option. :-( I had to improvise, and I love the end result! Hey- sometimes you have to work with what you got! Happy October and Halloween everyone! Thank you again for stopping by :-) I truly appreciate your comments and support! I hope you have a truly blessed and beautiful day! Wow thank you!! So sweet of you to say! Thank you, Sweet Becky!! :-) xoxo! Wow this is amazingly gorgeous. Your skin is flawless as usual. Soooooo pretty!! Def something i would wear! Ebay is the ish, you find anything there - yaaay ebay!! YES!! I knew you would feel me on the Ebay thing!! Yay!! Thank you, Janine! This is beautiful, love all the accessories. Yay Betzy!! I love it when you stop by! Thank you! absolutely gorgeous!!! i just love it! Thank you, Niki!! :-) So glad you like it! You are a gorgeous girl...and this is fabulous! I've never seen you do anything that wasn't totally impressive, but I pretty much dream of being a resident of Rivendell at least once daily...so this was especially appealing...haha. Hope you're smiling...you deserve lots of smiles...xoxo! Thank you so much!! And somehow I am totally not surprised that you dream of Rivendell also!! LOL! So glad you like it :-) I am smiling a lot more, especially now! xoxo! There you go again with all of your fabulous-ness. Colleen you are amazing, so talented and gorgeous to boot............inside and out! Thank you again, Debbie! :-) Really sweet of you to say! what an amazing look. I love your circlet and ear cuffs! So pretty! CIRCLET!!! That was the word I was searching for!! Thank you!! LOL! Thank you so much!! WOW!!!! Gorgeous look!!! Love it! Thank you, Elena! The latest illustration on your blog is absolutely adorable! Tiarni, I can't thank you enough for your kind words. Thank you so much! You are so sweet. And I'm thrilled you like the look :-) Happy Halloween! Traci you are so sweet! Thank you! WOW, this is really perfect, love your eyes!! Thank YOU, Ylenia! Thanks for stopping by! Love your blog! This is sooooo pretty! Your skin looks amazing. 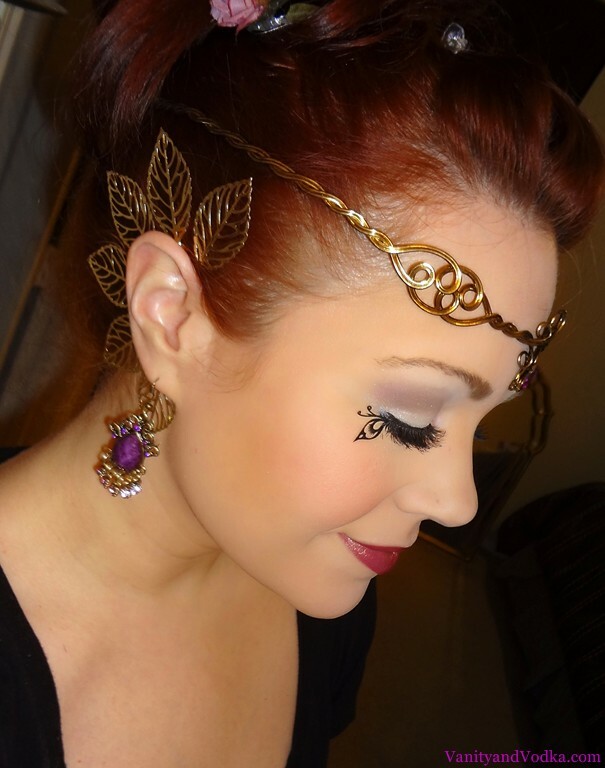 This is gorgeous, and I love the lashes and the ear cuffs! Hi colleen! You are just gorgeous and that makeup is so stunning! Very talented. Enter to win $100 worth of skincare products here! Why thank you, Kelsey! Of course :-) Have a great day! WoW!!! this look is very pretty. Now following you & thanks for your lovely comment on my blog. I think the bling really takes the look home~. Likewise, girl!! :-) Thank you! !